Reminiscing on the cool crisp days rather than the freezing cold ones that are randomly occurring. Oh what it’s like to live in the Midwest. Our strange weather made it a little challenging at first for the kids to put into words to describe fall. We did quite a bit of group brainstorming to gather up some fabulous adjectives to help us describe fall. 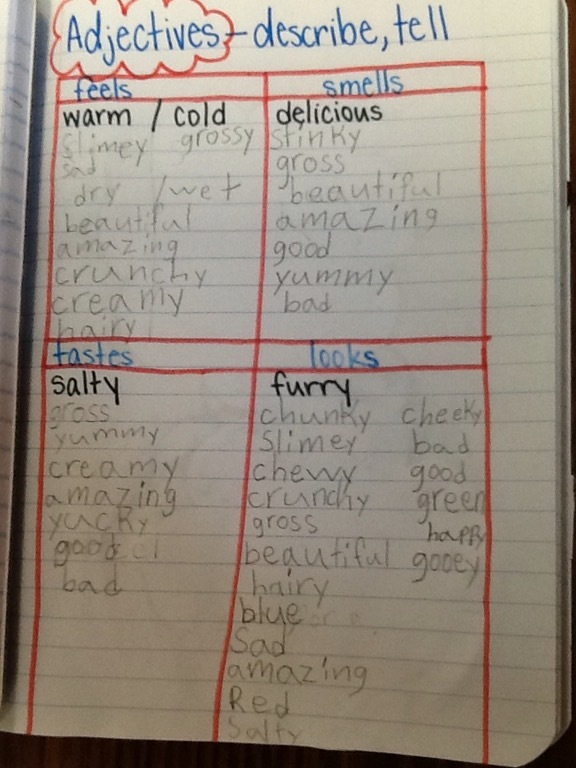 We came up with a grand list of descriptive words together and then transferred those to our own notebooks. 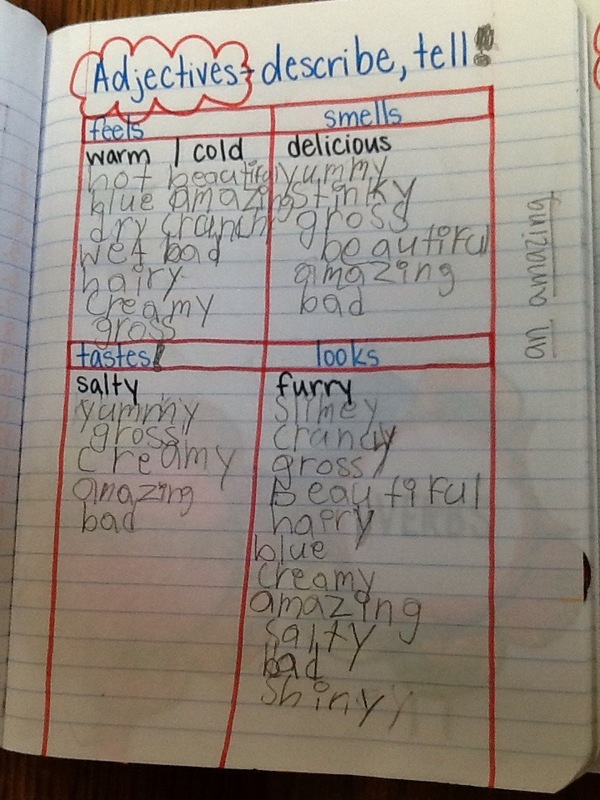 We discussed that adjectives are words that describe and give details to our writing. I’ve really been working with the more advanced students on writing structure and writing stamina. So many of their sentences are straight forward or beginner writing. There’s always more to be said and some details we left out. Adjectives help us to better our writing and fully explain what we want to say. It’s the colorful sprinkles on top of the already delicious ice cream. Where in the World is Ms. D? After completing a Bachelor’s of Science Degree with a major in both Early Childhood and Elementary Education, I took on some new jobs starting summer of 2015. I worked over the summer on the weather assist team at our larger State Farm Insurance branch here in town. I worked full time/40 hour weeks answering phone calls, taking copious notes, and scheduling tow jobs for the entirety of the summer. When school started again, I began substitute teaching and working as a paraprofessional within my local district. I taught at a variety of schools at every edge of town. I gained a lot of new experiences while working in specialized classrooms as a paraprofessional. These months gave me new opportunities to familiarize myself with more schools and colleagues. Over spring break 2016, I received a call for an interview at my (current) dream elementary school. The interview was super inviting, being surrounded by teachers I know, and laid back. Of course I was still nervous, but it went great. Long story short…that job was given to someone else. However I did still end up at that dream school. Since then I’ve been working at my (current) dream school as an ELL (English Language Learners) Instructional Aide. I never would have imagined I’d be in this position, but now I don’t want to leave. I’ve grown to learn new things while teaching old things to newcomers. They’ve taught me about their culture and language while I teach them English, grammar, spelling, and writing skills. It’s been a busy job and I work mainly in the hallways of the school, but I enjoy it. I’ve looked extensively into TESOL (Teaching English to Students of Other Languages) programs in order to get certified to be an ELL teacher. It’s a good possibility to diversify myself and extend my teaching abilities.